Photos by Greg Armstrong and Mary DiBiase Blaich. 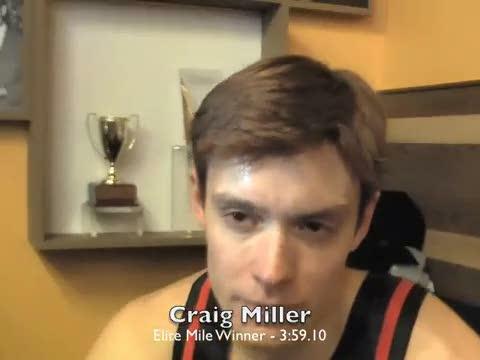 Post-race interview with Craig Miller, winner of the elite men's mile in 3:59.10. Mary Cain (Bronxville, NY) and Chad Noelle (Greene, NY) win this week's awards after strong races at The Armory and Madison Square Garden. 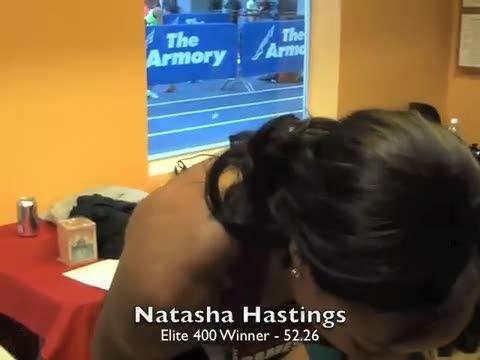 Natasha Hastings took a step Saturday, winning the elite women’s 400 at the New Balance Games in 52.26 seconds. She is back training with Curtis Fyre, who coached her at South Carolina and is now managed by her mother, Joanne Hastings. The night before at the Great Dane Classic, Hastings clocked won the 60 in a personal best 7.28. (photo by Marleen Van den Neste) Tate - 4:17 mile! Reagan Anderson 5:03! Tatnall boys state record 4X8 - 8:09!!! New York’s own Natasha Hastings will return to the New Balance Track and Field Center to defend her crown Saturday in the Elite Women’s 400 meters at the New Balance Games. Hastings, an A.P. Randolph graduate, won the event last year. After an amazing college career, which was proceeded by signing a professional contract with New Balance, we haven't heard much from Jenny. Now married and having changed her last name from Barringer to Simpson, the Oviedo High alum is back in action after a 7-month layoff due to a hip injury. And apparently is doing just fine! Claudia Francis has plenty going on. The Cardozo senior competed in three track meets in five days ending Monday at the MLK Relays. She has a final exam tomorrow in science class and she still needs to make a decision on where she will compete in college next year.